What a summer it was at Indo Jax Surf School and Charities! This year we were honored to be chosen for a TV series, The Hero Effect, that starts on November 12. 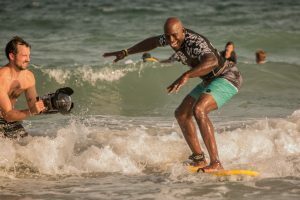 Indo Jax Surf Charities will be highlighted in the 10th episode. Our episode will air in March or so. This Docuseries was created by Dolphin Digital and United Way International, choosing 10 charities throughout the United States to be part of this program. We were 1 of 10 charities in the nation to be chosen! The film crew came out to our location at Wrightsville Beach a couple times to film our outreach camps. They filmed our Cancer Surf Camp and Visually Impaired Surf Camp and it was a real delight to have them on hand. The TV Hosts were Ex Pro Football Player Donald Driver of the Green Bay Packers and Actress Emily Wilson of General Hospital. The hosts participated, surfed and cheered on our Visually Impaired Surfers. In the end they announced the series will be airing on the Oprah Winfrey Network. Stay tuned for more information on our episode on The Hero Effect.